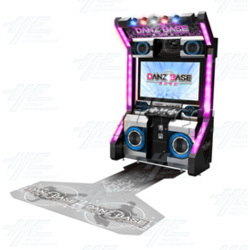 The Danz Base arcade machine is a music, dance and rhythm game in which players most mimic the avatars on screen and keep in time to pass songs. It is an interactive, two players somatosensory dance machine and features motion sensing, interactive lights and double woofer functions, and 4 players are available to play a game at the same time through video with the Global Network function. Danz Base includes popular songs from all over the world, including America, Europe, Korea, Japan and amount vast productions from China. The gameplay concept is quite simple, follow the foot and hand movements of the characters on screen, but this can range from being easier for new players or quite challenging for experienced players. This makes it easy to understand and suitable for players of all ages. Danz Base uses the unique ARKOPAZE system: based on lendon, offering players interactive service on multi machines, allows player to exchange award on other machines like Muzibox DJ when they reach achievements on Danz Base. This machine is quite big, and stands out on any floor in any location. Due to its' size and the fact that it is suitable for players of all ages, this game works well in larger locations, such as Family Entertainment Centers. It is an interactive, two players somatosensory dance machine and features motion sensing, interactive lights and double woofer functions, and 4 players are available to play a game at the same time through video with the Global Network function. Danz Base includes popular songs from all over the world, including America, Europe, Korea, Japan and amount vast productions from China. The gameplay concept is quite simple, follow the foot and hand movements of the characters on screen, but this can range from being easier for new players or quite challenging for experienced players. This makes it easy to understand and suitable for players of all ages. Danz Base uses the unique ARKOPAZE system: based on lendon, offering players interactive service on multi machines, allows player to exchange award on other machines like Muzibox DJ when they reach achievements on Danz Base. This machine is quite big, and stands out on any floor in any location. Due to its' size and the fact that it is suitable for players of all ages, this game works well in larger locations, such as Family Entertainment Centers.